Inspired by the plight of the dairy farmer, Howard Buck in 1949 founded what would be known as National Soft Water Service in West Liberty, Ohio. While working as a field man for Borden Milk Company in Shelby County, Buck first realized the need for soft water after watching dairy farmers use rods and hammers to break through the calcium deposits on the outlets of their milk house heaters. Compounding their problems, the dairymen’s utensils– then washed in hard water-accumulated iron and calcium, forming a film called “milk stone”. Milk stone was a haven for bacteria growth, resulting in high bacteria count and loss of income for the dairymen. In an effort to help find a remedy , Buck traveled to Illinois, which at that time was the headquarters for the water condi-tioning industry in its infancy. Howard started out of a rented garage making installs with his Studebaker car. Dairy farmers were so impressed with the water softening known as “exchange” tanks; many had them in-stalled in their homes. As the use of in-home water increased with the advent of automatic washing ma-chines, water softeners were also developed to automatically create their own brine solutions from dry salt, and regenerate themselves. Lowell Buck, the son of Howard, was the 2nd generation family business owner. Lowell was instrumental in evolving the company from the exchange tank procedure to the fully automated water softeners. Estab-lished routes would then deliver bagged salt to commercial and residential customers. 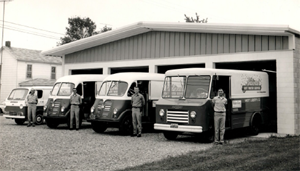 In 1985, National Soft Water Service opened up a conven-ient full service branch store in Bellefontaine offering a full line of water softener salt. Another Branch store was soon opened in Marysville, Ohio. In 1989 Lowell approached his son Steve Buck with the idea of beginning a forklift delivery wholesale distribution division. This formed the 3rd genera-tion development of the family business and the beginning of the wholesale salt division. In 1993, National Soft Water Service sold the water conditioning entity to Hague Water Conditioning in Groveport, Ohio. At that time National Salt Distributors, Inc. was formed. In 2013, after graduating college, Steve’s Daughter, Delanie Buck, joined the business which formed the 4th generation development of the family business. 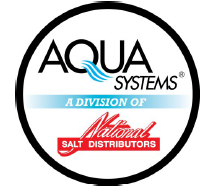 National Salt Distributors, Inc. today has 2 divisions of business, the Aqua Systems Retail Division and Wholesale. Aqua Systems Retail Division – The retail division consists of two retail locations, 1515 S. Main St., Bellefontaine and 806 Columbus Avenue, Marysville, Ohio. 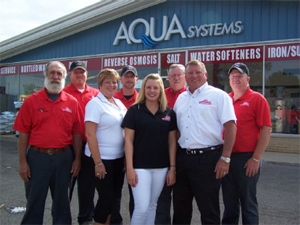 As Steve likes to say about their retail stores, “Salt is just the beginning!” The Retail Division includes full service Aqua Systems water treatment dealer-ship offering sales, service, financing and rentals. In 2002 NSD began a Residential/Commercial Delivery service for Logan & surrounding counties. NSD was the first to offer state of the art delivery software to pro-vide you with the best delivery means available. NSD can schedule a convenient hassle-free delivery to meet your salt & water needs. Water cooler sales and rentals are also available for delivery and set up. Steve Buck is the President & CEO of National Salt Distributors & Aqua Systems. Our staff includes Cindy Mo-yer, Office Manager, Thom Woods, Bellefontaine Retail Manager, Delanie Buck, Wholesale Sales Representa-tive, Steve Kingrey, Marysville Store Manager, John Corwin, Wholesale Transportation, Randy Lattimer, Water Treatment Sales Manager, Merle Coblentz, Water Treatment Tech/Installer, Chris Pratt, Home/Commercial Delivery Representative. When asked what separates National Salt from their competition, Buck states “Its good customer service & quality products, plain & simple. Since 1949, NSD has continued to build their business on customer satisfac-tion, service, honesty, & quality products. All of our products are guaranteed to work as promised. We appreciate our customers and strive to express that to them with each and every visit”. “We are very involved and committed to this community. Since we are a family owned & operated company you can be assured your money is staying local. Our convenient retail store offers quick in-and-out service. We offer a weekly salt sale, and as always, the 11th bag is free! I have received a lot of satisfaction from belonging to and being Past President of the Bellefontaine Rotary Club and a 28-year member and former 6-year Logan County Area Chamber of Commerce Board Member and enjoy the fulfillment of being involved and giving back to the community,” says Steve. Steve Buck shares, “I would like to personally thank the Logan County Area Chamber of Commerce for supporting Logan County businesses for over 70 years now. The Chamber has been a valuable resource for all businesses and I would encourage any business, small or large, to get involved today and help support them in their mission to expand our community with new business and development. This August NSD celebrates 66 years in business! We thank the Buck family for their 28 years as Logan County Chamber of Commerce members and their years of service to Logan and surrounding counties. Congratulations to Steve and his team on being the June Business of the Month!